Oscar Giroux watches the closing minutes of the 103rd Grey Cup game between the Edmonton Eskimos and the Ottawa Redblacks. 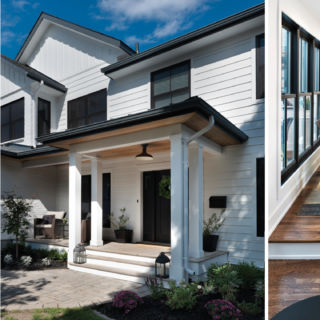 Photo above by Jana Chytilova, OTTAWA magazine. 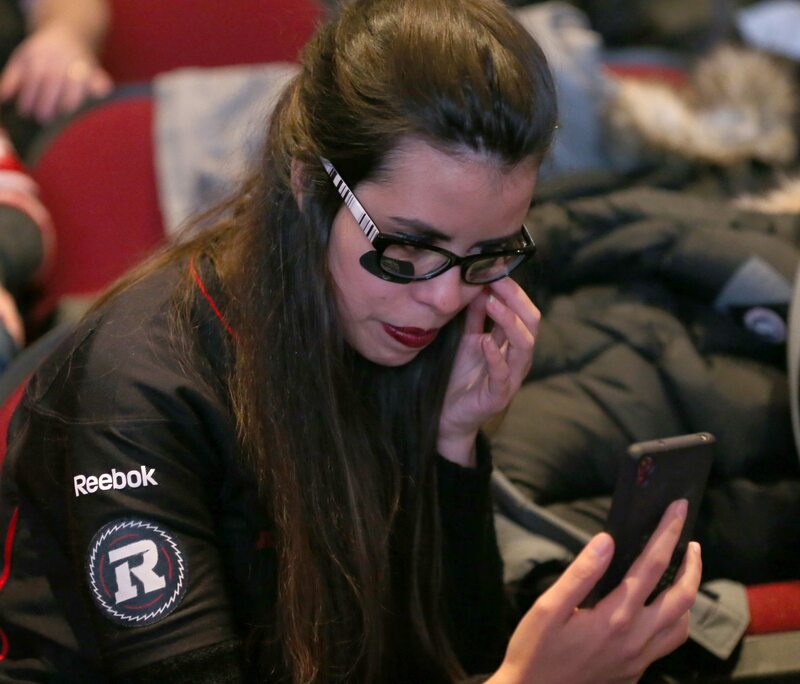 The Cinderella season of the Redblacks finally came to an end Sunday night as their dreams of taking home the Grey Cup came to an end at the hands of the Edmonton Eskimos. It was a heartbreaking loss for the team, which had enjoyed an early lead, as they surrendered the Cup in a 26-20 final. 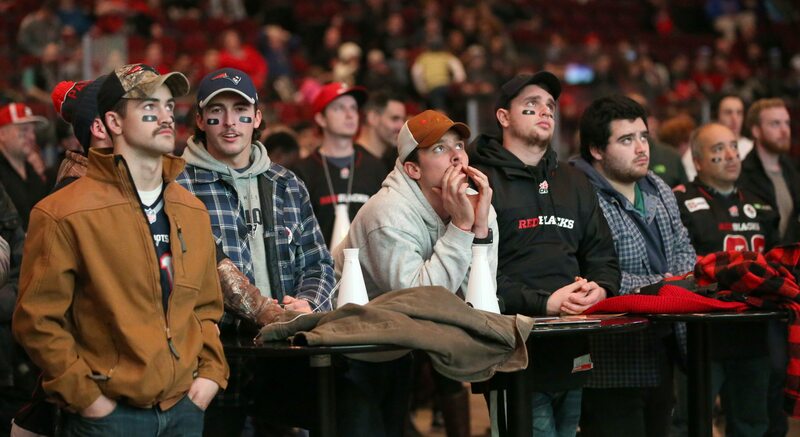 Earlier in the evening Lansdowne had come alive with the audio from the pre-game blaring, cowbells clanging and the chatter, chants, and shouts of hundreds of Ottawans who came out to cheer on their team on the big screen at TD Place. 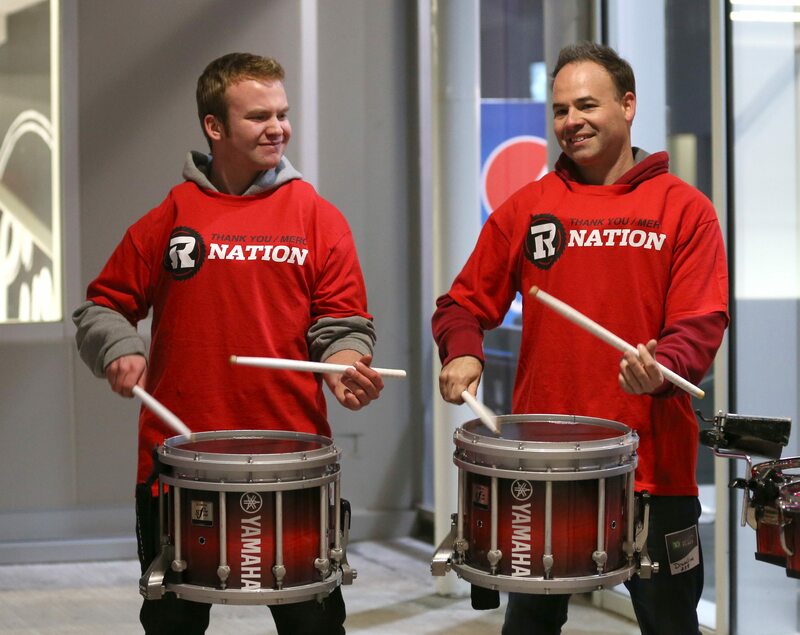 A drumline plays prior to the start of the 103rd Grey Cup game between the Edmonton Eskimos and the Ottawa Redblacks at a viewing party at The Arena at TD Place. 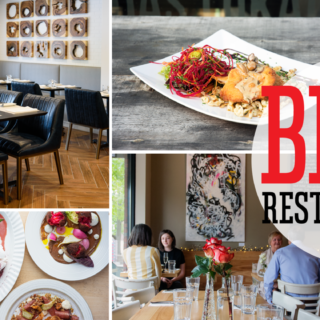 Photo by Jana Chytilova, OTTAWA magazine. 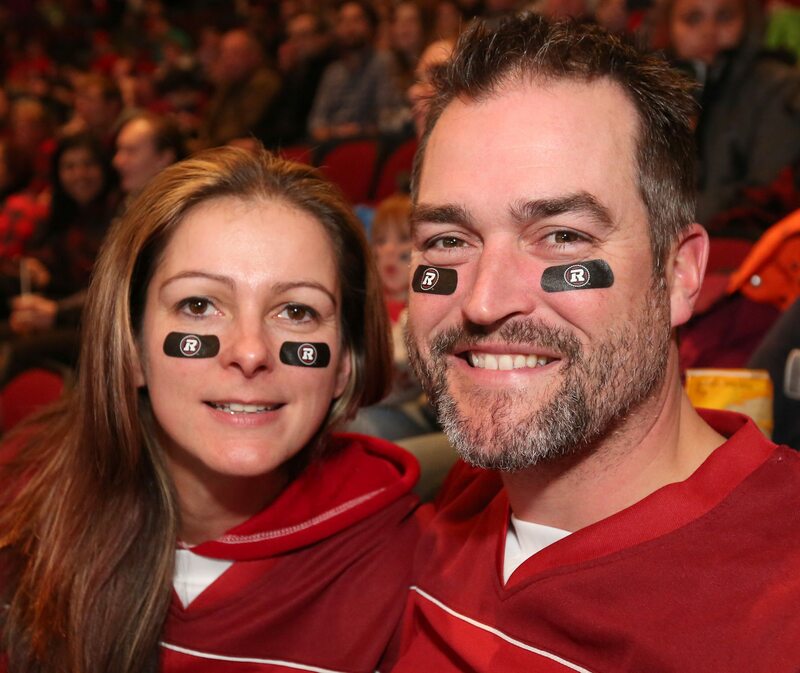 Jennifer Coles, left, and Emile Beaudry, right, were decked our in red and black. Photo by Jana Chytilova, OTTAWA magazine. It was, quite simply, a sea of red and black. There were hundreds of fans, cheerleaders, Lumber Joe, (the team mascot), and the typical game-day fare: poutine and beer. The crowd was reminiscent of last week’s Eastern Division final crowd in one way in particular. Uly Neves applies Charcoal strips prior to the start of the 103rd Grey Cup game between the Edmonton Eskimos and the Ottawa Redblacks at a viewing party at The Arena at TD Place. 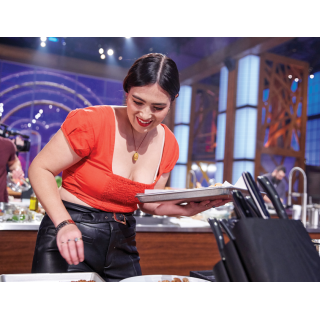 Photo by Jana Chytilova, OTTAWA magazine. Fans were lining up at Lansdowne for the Grey Cup viewing party’s gates were even open. Lynette Duchin. left, and Rene Dutchin ham it up prior to the start of the game. Photo by Jana Chytilova, OTTAWA magazine. Football used to be a thriving venture in Ottawa. The Rough Riders, formerly North America’s oldest team, were formed in 1876. In 1958, they became a founding member of the CFL. In their 120 years – the team folded in 1996 – they won nine Grey Cups. 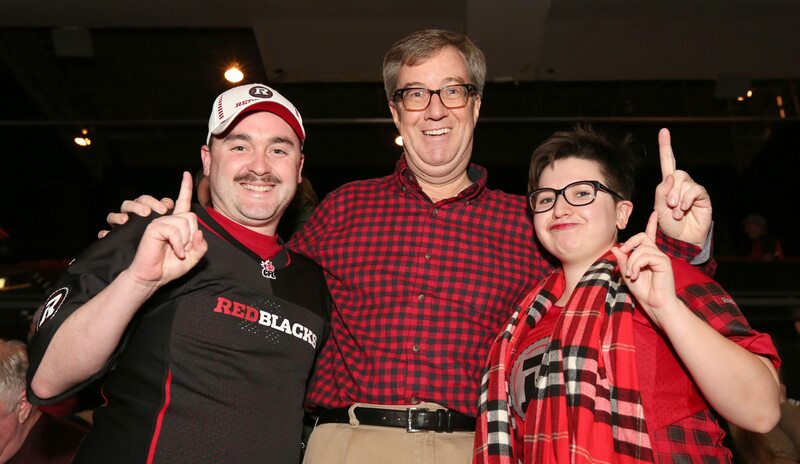 Walter Logue, left, Ottawa Mayor Jim Watson, centre, and Rosemary Cot, right, cheer prior to the start of the 103rd Grey Cup game between the Edmonton Eskimos and the Ottawa Redblacks at a viewing party at The Arena at TD Place. Photo by Jana Chytilova, OTTAWA magazine. They found most of their successes in the ’60s and ’70s when they won five of the nine. The last time they competed in the Grey Cup was 1981 and the last time they won was 1976. CFL in the capital was briefly revived in 2002 with the Renegades, but the franchise was finished in 2006 due to financial instability. Ottawa went without for eight years. 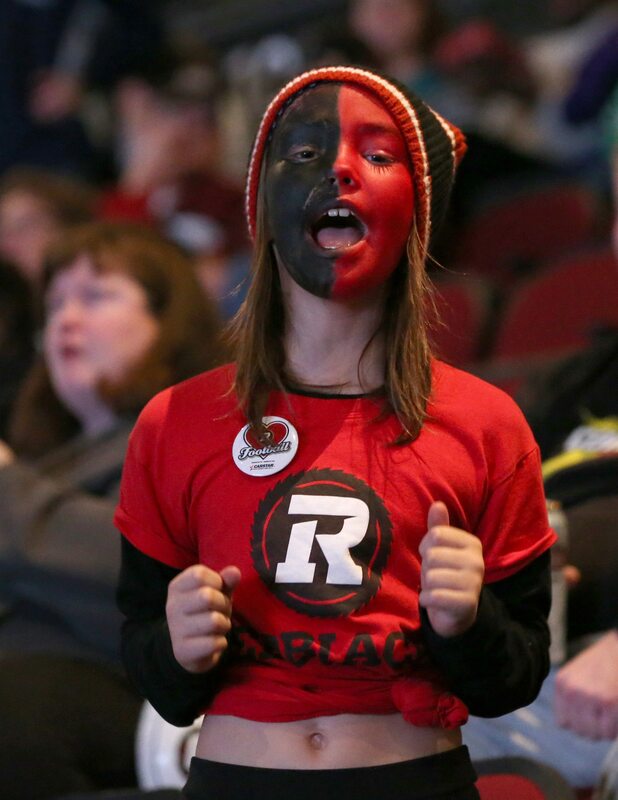 Sophie Gingras, nine, showed her true colours — black and red, of course. Photo by Jana Chytilova, OTTAWA magazine. Sue Prosser, left, and Jackie Humble get into the spirit. Photo by Jana Chytilova, OTTAWA magazine. Their first season was nothing to call home about, coming last in their division, they won only two of 18 games. But 2015 brought an entirely new energy, with the team coming first in the East and today compete against the Edmonton Eskimos in Winnipeg for the Grey Cup — for the first time in 34 years. Mark Wade was all smiles as the #REDBLACKS took an early lead. Photo by Jana Chytilova, OTTAWA magazine. With two touchdowns in the first 15 minutes of the game, fans were on their feet. 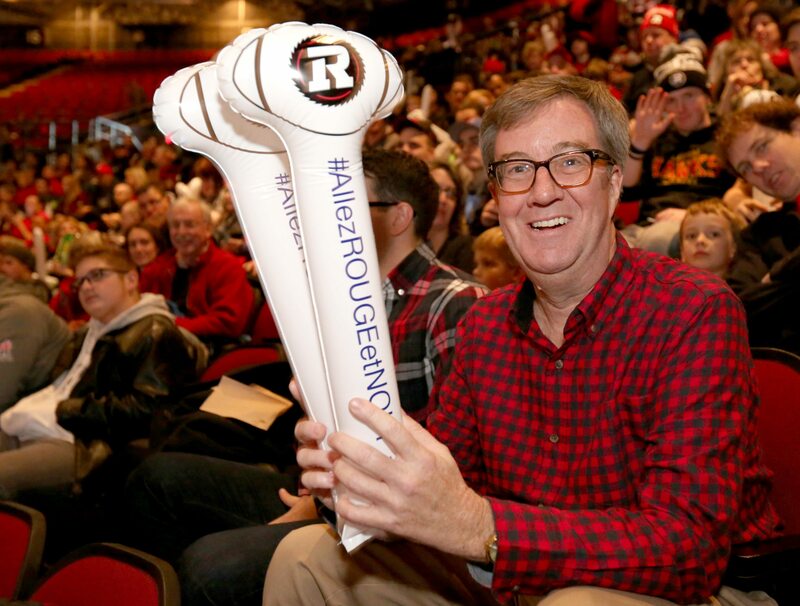 But by half time, Ottawa Mayor Jim Watson’s score prediction of 21-14 (for Ottawa, of course) was no longer possible and the Eskimos were leading by one going into the second half. 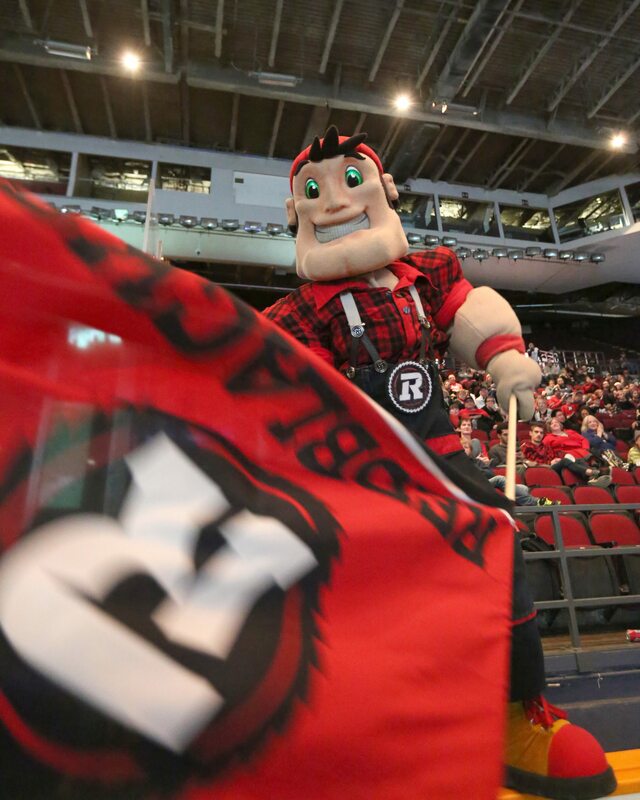 But despite the turn of luck, fans were still feeling a RedBlacks victory. Mayor Jim Watson was in the house! Photo by Jana Chytilova, OTTAWA magazine. 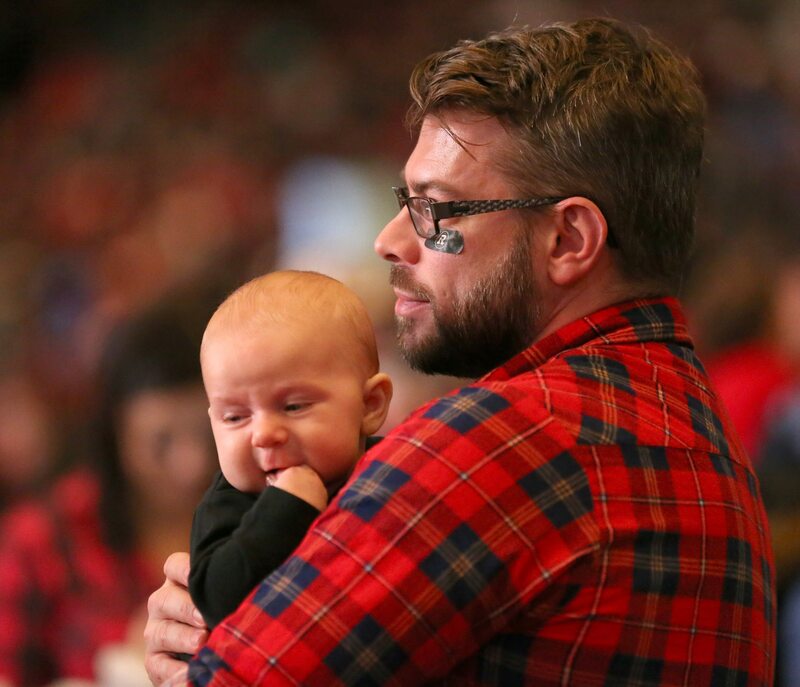 Mike Rafter and his son Milo, three months, watch the game. Photo by Jana Chytilova, OTTAWA magazine. The stadium emptied much more quietly than it filled as fans began to try to make sense of what went wrong. “It was a tough game, it was well played, but I wish the quarterback played better in the fourth quarter,” said Sharhan Sanwar. Fan Gary Chen said he thought quarterback Henry Burris may have crumbled. 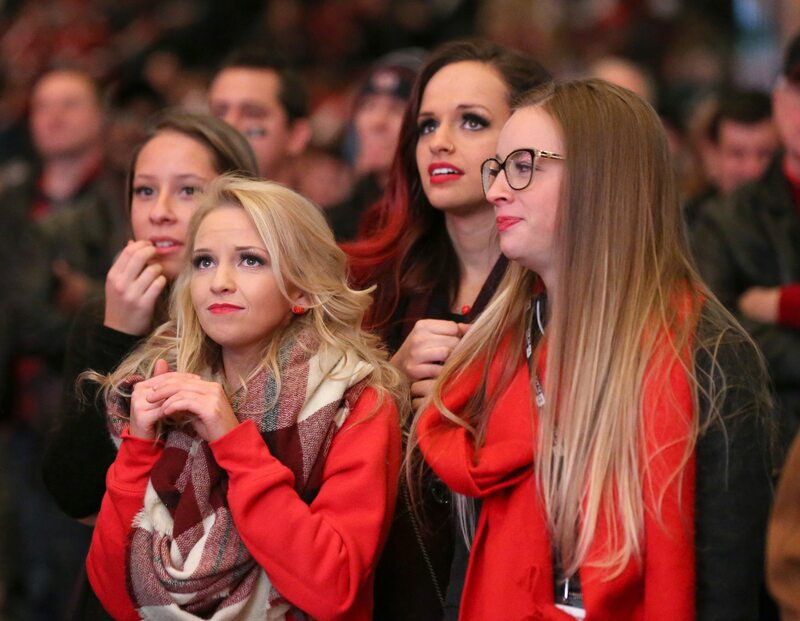 From left to right: Ashley Gentille, Emma Caldwell, Ruslana Malytska and Alex Robitaille watch as Edmonton takes the lead late in the 4th quarter. Photo by Jana Chytilova, OTTAWA magazine. Others looked for a decisive moment when the tide turned. Big Joe tried to rally the fans. Photo by Jana Chytilova, OTTAWA magazine. 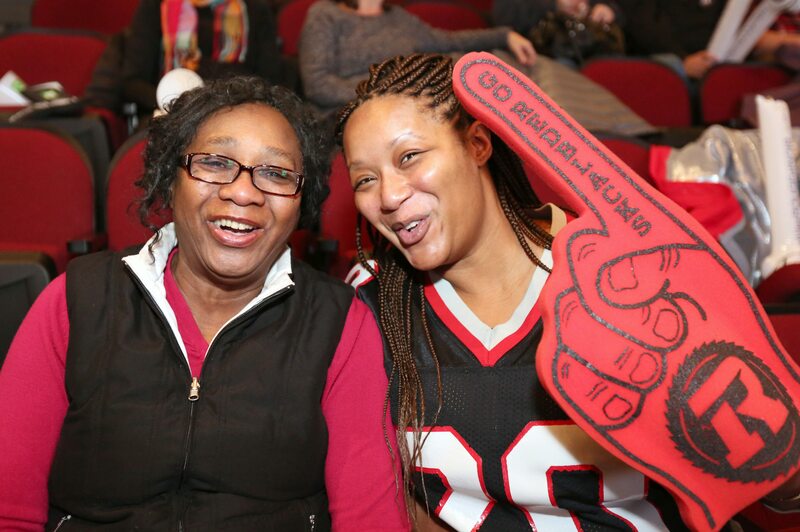 But despite the loss, Ottawa fans remained faithful. “They have our support. And we’ll be here next year,” said Carrie Searns. 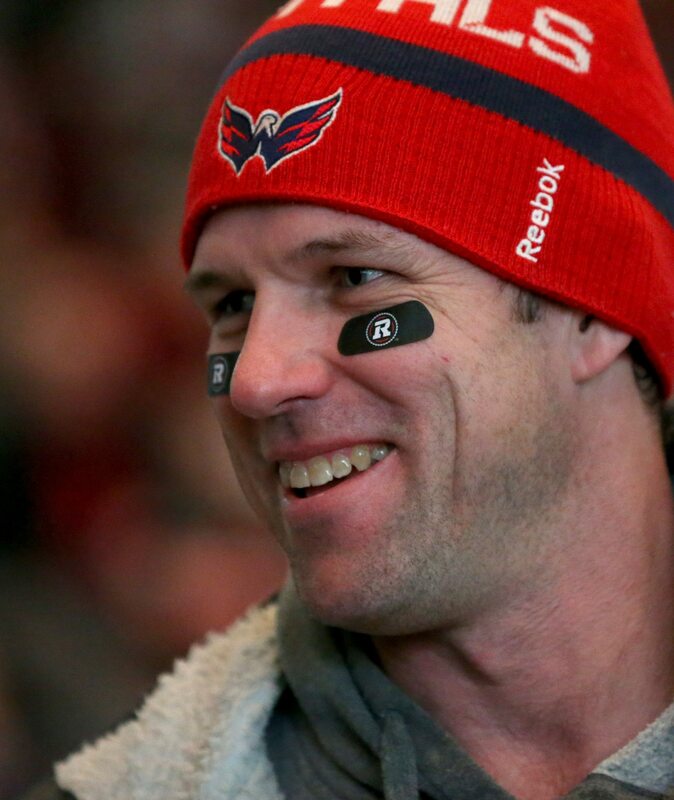 “Incredible season — exciting to watch every game. Making it to the Grey Cup finals is amazing,” Searns added. 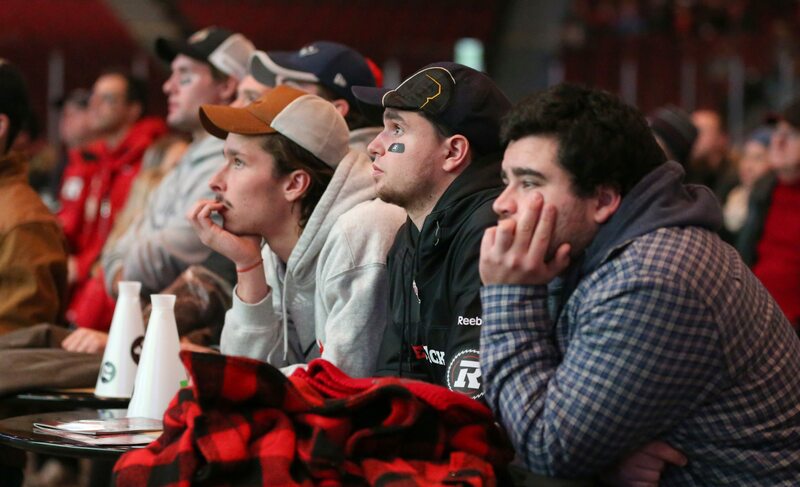 Fans react as time counts down and Edmonton takes a lead late in 4th quarter. Photo by Jana Chytilova, OTTAWA magazine. Turning the team around in one year and into Grey Cup contenders was clearly a feat fans recognized (except, perhaps, for the young boy crying into his father’s arms outside the arena). 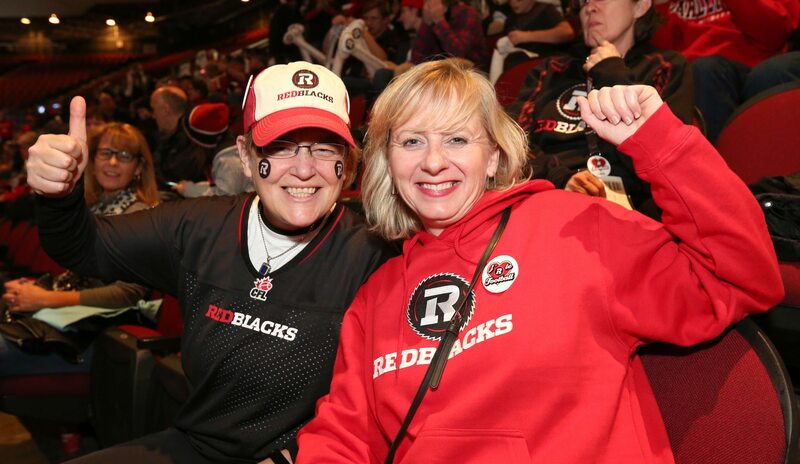 For more images from the Redblacks viewing party, check out our photo album on Facebook. For Ottawa fans, the final score was tough to swallow, but most remained positive about the team’s future. Photo by Jana Chytilova, OTTAWA magazine.